Sparta Systems, the maker of TrackWise software identified a list of best practices to help ensure supply quality and regulatory compliance in the food and beverage industry. These strategies, when implemented correctly, can help organizations avoid the massive supply recalls, consumer complaints and illnesses that have dominated headlines in recent months. 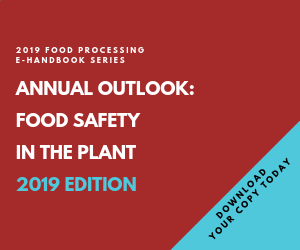 In the past 12 months, food supply quality has sparked global safety concerns, which must be addressed head-on before public confidence in the food manufacturing industry can be restored. The United States market has experienced food quality catastrophes resulting in millions of dollars in lost revenues, massive quantities of tainted and wasted supplies and even consumer deaths. To safeguard consumers from similar quality disasters, it is critical that food and beverage companies effectively produce, manage and track goods, information and resources across the enterprise and supply chain while adhering to increasingly stringent quality standards. The recent food and beverage industry issues have revealed that regulations set forth by governmental bodies have not been effectively enforced. While regulatory requirements such as HACCP procedures, OSHA and ISO 22000-based standards call for food and beverage companies to have effective systems and controls in place to ensure safety and quality, efforts to meet these standards are often viewed as a detriment to bottom line success, and until now the regulations have not been strictly enforced. Sparta’s team of quality experts has recommended six critical steps that will help make the food production process safer. These suggestions for proactive food protection will not only help protect consumers against tainted food, but should also serve to streamline manufacturing processes and ensure the viability of food. Manage, track and report on nonconformances, investigations, corrective and preventive actions and other actions when requirements are not met. Food and beverage manufacturers need a holistic and centralized system in place to quickly respond to supply quality issues and limit the impact of incidents. Track a multitude of suppliers with enterprise-wide supplier quality management tools. As companies source ingredients from more suppliers and locations around the globe, manufacturers need to monitor and manage risks across the supply chain to protect stakeholders and consumers alike. Improve safety and manage training, procedural changes and preventive maintenance schedules. By implementing end-to-end safety process tracking and workflow management, manufacturers can ensure greater control of the quality process, proactive identification of potential issues, increased team accountability and reduced costs in managing safety issues. Enforce standardized change control procedures, while also allowing for flexibility to meet specific workflow steps based on the type of change. Companies can reduce the need for costly recalls or wasted supplies by ensuring efficient and effective reconciliation of changes in the manufacturing process. Monitor critical processes, identify gaps and improve quality with audit management. While regulatory compliance questions are now being raised in light of recent food safety headlines, manufacturers should always implement proactive programs to manage supply quality issues and remove the potential for critical incidents. Ensure compliance with industry standards for employee and supervisor training on proper safety procedures with training management.